Miles of Caribbean shoreline give Puerto Rico a border of beautiful white sand beaches and turquoise water. Beyond the beach, you can experience the unique culture of Old San Juan or the vibrant downtown nightlife. With Southwest Vacations®, deals on a fun-filled Puerto Rico vacation packages are right at your fingertips. Stunning hotels and luxurious resorts are available with a complete San Juan vacation package. Enjoy accommodations for every budget with Puerto Rico hotels near El Yunque National Forest, on Condado Beach or Coco Beach, and within the Isla Verde area. Venture to roads less traveled and discover one of the most popular sights on the west coast of Puerto Rico, the Natural Stone Bridge in Cabo Rojo. This natural bridge/arch is surrounded by bright red limestone cliffs and a beach cove fit for a pirate where the sunset light creates a dramatic scene like nowhere else on the island. This luxurious resort boasts an atmosphere of first-class elegance and unforgettable service. Overlooking Puerto Rico’s famed Condado Beach, this relaxing oceanfront resort appeals to everyone. Hip and cool, retro and chic, stylish and sophisticated – this is the quintessential San Juan beach hotel, and the place to be at. 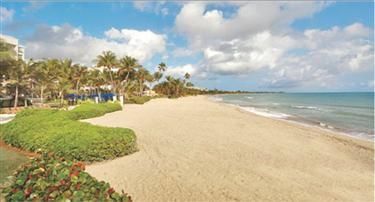 Fronting two miles of white-sand beach on Isla Verde, this hotel offers the ideal setting for unforgettable vacation. Southwest Vacations packages to San Juan, Puerto Rico offer a wide variety of hotels and activities with some of the best Puerto Rico deals around. Click here for details and updates on the impacts of the recent Caribbean hurricanes. Experience all the famous things to do in Puerto Rico. Combine casinos, spas, and old world charm with beautiful beaches and all the natural beauty throughout the island of Puerto Rico for a perfect San Juan vacation. Puerto Rico is an excellent choice for a Caribbean island vacation destination where you can revel in the warm waters at the tropical beaches, experience entertaining nightlife, and win big at lavish casinos. The rich culture of old San Juan can be found in the Spanish architecture, charming cobblestone streets, and the sturdy forts guarding the city. Explore El Yunque National Forest where plenty of hiking trails take you to see the numerous resident species of birds and native orchids throughout the rain forest. Within the San Juan area, visit Luquillo Beach where huge plantations of majestic coconut palms shade the soft sandy beach. Thirsty for rum? Tour the Bacardi distillery and learn how the world-famous local rum manufacturer produces their tasty and popular product. Include these San Juan activities and tours in your fun-filled vacation to Puerto Rico. Flight service to San Juan may vary based on departure date and origin city. View our flight information, so you can vacation with ease.